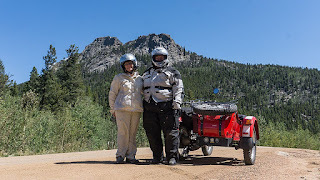 Martha and I, riding on Scarlett, my 2014 Ural Patrol Sidecar rig...rode into the nearby mountains to the town of Nederland (Home of the Frozen Dead Guy) this morning. 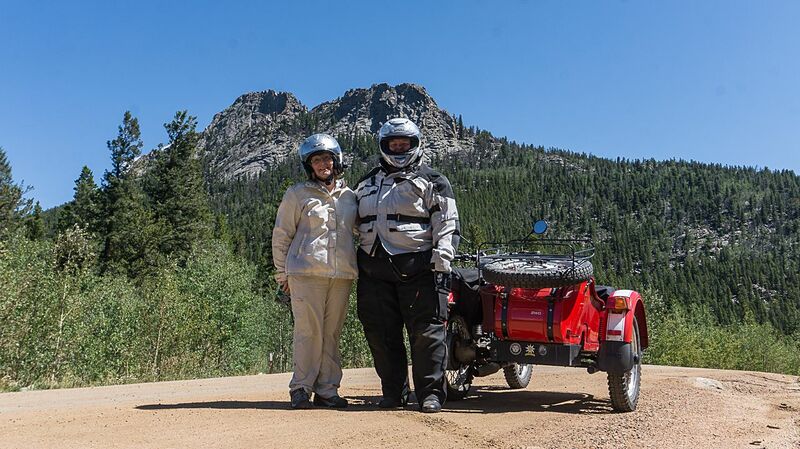 The mission was to meet fellow moto-blogger Beemergirl aka Lori and her husband Oilburner aka Chris. We met at the New Moon Bakery and Coffee Shop and chatted up a storm while enjoying some Bacon Wraps. Well, mostly Lori and Martha chatted up a storm while Chris and I jumped in every now and then. After breakfast, and since Chris had a couple of hours before having to report to work at Brainard Lake Recreation Area (where they're sort of work-camping); we rode out towards Rollins Pass. Chris and Lori on their spiffy Honda CBX500X motorcycles. Martha dubbed them Thing One and Thing Two, the motorcycles that is, since they'd not named them yet! We got to the eastern entrance of the Moffat railroad tunnel and stopped for a quick picture in the nearby parking lot. At this point we said goodbye to Chris as he had to ride up ten miles or so back to his Brainard Lake where he mans the fee station as part of a summer gig to "test the waters" of work-camping. 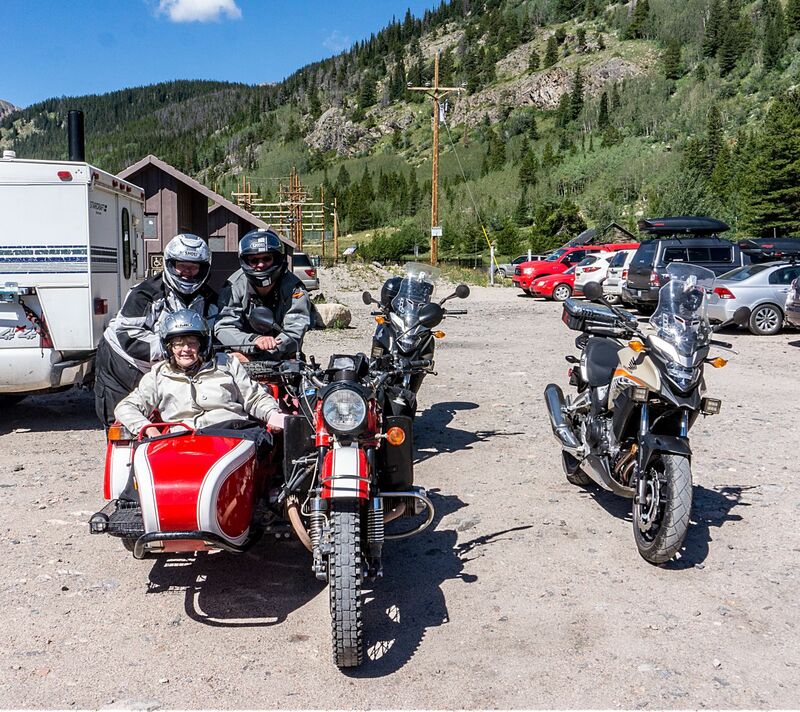 Lori stayed with us and we proceeded to ride down to Golden Gate Canyon State Park via Gap Road. 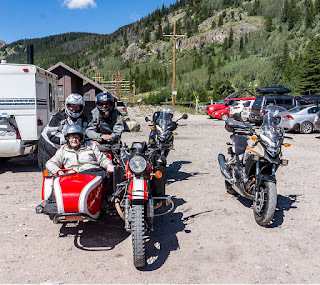 The rest of the ride was through twisty canyon roads, bounded on both sides by thick pine forest with the occasional patches of Aspen trees. We chatted via our Sena Bluetooth headsets which made it an easy way to pass the time and describe things to Lori as we saw them. We took a small break in the town of Pinecliffe on CO72, got UDF'ed by a K Bike Rider for a bit and then we headed back towards Nederland for lunch. We decided to try the German Restaurant at the edge of the city and it turned out it was it's last weekend in operation! It's a family business and the patriarch had decided it was time for the family to retire from the restaurant business! After a very leisurely lunch of delicious bratwurst, sauerkraut and mashed potatoes, and with heavy weather moving in from the North, we parted ways with plans to get together soon for more riding! As Lori rode back to Brainard Lake, we hit traffic blocks due to a bicycle race that was using Golden Gate Canyon as part of its route. We diverted back towards CO72 and twisted and turned our way, in mild rain and wet roads, to exit way north of Golden. Traffic was crap, still due to the bike race, and we slogged our way to another major traffic detour that forced us into Arvada. We finally made our way south from 64th Avenue to the I-70 slab where traffic wasn't too bad. Of course, then I got on I-25 south and traffic was basically slow and go all the way to I-225 and Parker Road. Traffic was heavy and roads were mostly wet though I did manage to avoid a couple of spots where large puddles had formed. Figure another hour from what normally would have been a 2 hour drive.....way too many people and a road infrastructure that can't handle bicycle racing events. Great meeting with Lori and Chris and looking forward to our next ride with them. 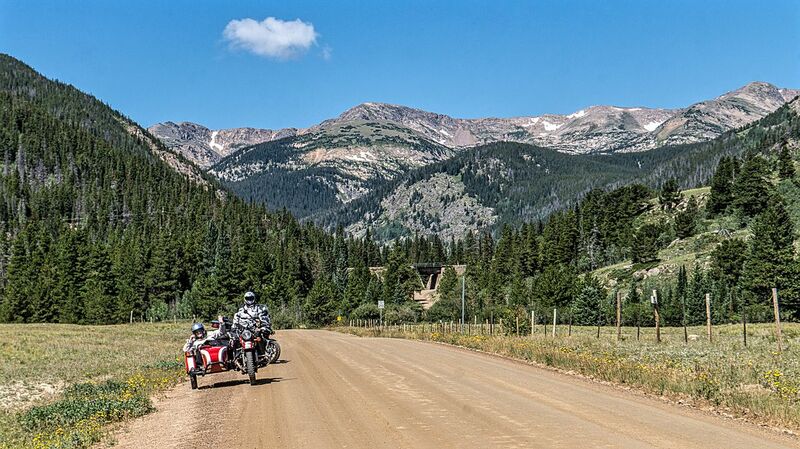 Lori has one more week of remote work and then she'll be on vacation so I'm hoping they'll be able to ride Pikes Peak and Mount Evans! How many friends have you made through blogging? Countless Bridget, countless! from varied and unlikely walks of life....all sharing a common love of riding. It was great to meet you both!!! I can't tell you how much I appreciate you slogging through all that traffic to make it to our side of town!! Especially when I hear about what you had to go through getting back! Darn cyclists! Remember...when you start to feel "sick" some Tuesday or Wednesday, we know the cure! Can't wait to ride with you again. HI Bridget!! You are next! :) I've only met Richard, Mike in Maine and Rogey from New Zealand. Was happy to add Dom and Martha to that roster. Looking forward to meeting you! I was wondering if you were going to meet up with them. I didn't know about the work-camping gig but I've given that more than a passing thought. That probably works well for really busy camping areas such as Colorado. How were their bikes transported? In the back of their truck? It was our pleasure BeemerGirl! They transported them in back of their tow vehicle, a van of some sort...didn't see their setup. The frozen dead guy story is a bizarre one. Filed under "People who are genuinely weird". Hurray for another moto blogger meeting. That's awesome, and the new header pic is beautiful, Dom. Thanks SonjaM, and yeah, very weird story. How very cool you all got together. I wondered if there would be a meet up when I saw Chris and Lori were in CO. They say you meet the nicest people on a Honda. Your experience Dom suggests there are other avenues. My own experience -- I only meet characters. You, Riepe, Richard and others. No normal people yet! Normal is usually boring Steve....thanks for grouping in with the likes of Jack Riepe, I can only aspire to his "character".